Since SCI is associated with loss of mobility, paralysis and mortality due to other opportunistic infections, it is known as the most critical and disastrous medical condition. As per the reported cases every year around 2, 50,000 to 5, 00,000 people are suffering from the spinal cord injury. On an average, middle aged and young adult males are more susceptible to SCI mainly due to avoidable causes such as road accidents, injury, falls or violence. Mortality associated with SCI has been observed to be the highest immediately after the injury than in later years. The risk of mortality doubles up with the severity level and is observed to be strongly influenced by the immediate availability of the best medical care. Preventable secondary opportunistic infections are also reported to be a major cause of death in many of the SCI patients especially in the lower income groups. Almost about the 90% of people in the age group of 20-45 have been reported to face other complications such as limited employment, decreased quality of life, and severe depression. Motor cycle road accidents or accidents without protection leading to the traumatic spinal cord injury. In the aged population or women with osteoporosis the SCI is often caused due to a fall. About 15-20% of the reported cases of spinal cord injury are as a result of violent encounters such as gun shots, knife wounds, fights, etc. Some of the athletes who undergo impact sports or diving, etc. have as well been reported to have been pray to SCI. Some of the diseases such as cancer, arthritic, osteoporosis and inflammation of spine can as well cause Spinal cord injury. Complete SCI: – If all the sensory and motor functions are lost, the injury is referred to as complete spinal cord injury. Incomplete SCI:-If some degree of motor and sensory function is retained after the injury, it is referred to as incomplete spinal cord injury. Tetraplegia: – All the limbs including arms, hands, legs, pelvic organs are paralysed by the injury. Paraplegia: – Part of the body is paralysed. Functional loss of the movement. Functional loss of sensory organs such as ability to sense heat, cold and touch. Changes in sexual activity including sexual sensitivity and fertility. Difficulty in breathing and coughing. Extreme pain and pressure in lower back, neck as well as head. Weakness, lack of coordination or paralysis in any part of the body. Tingling sensation especially in the lower limb region. 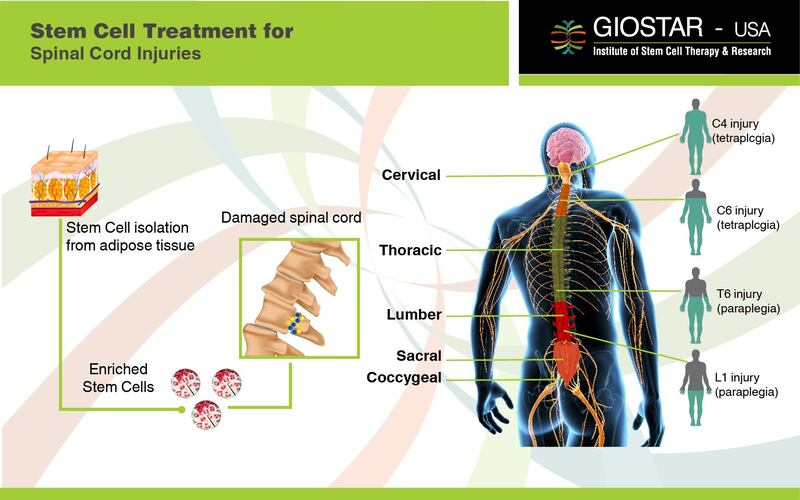 What goes wrong in Spinal Cord Injury! Each neuron is made up of a cellular body with a long slender projection called as the nerve fibre. These fibres are attached to the other fibre to form a dense network of cells. In general, neurons carrying messages down the cord from brain to other organs of the body are known as Motor Neurons. These neurons control the muscles of some of the important internal organ of the body such as heart, stomach, intestine, etc. The neurons travelling up the cord to the brain are known as Sensory Neurons, carrying sensory information from skin, joints and muscles to control our ability to sense, touch and regularize temperature. Thus stem cells treatment involves administration of concentrated cells in the targeted area, wherein they can colonize in the damaged area, adapt the properties of resident stem cells and initiate some of the lost functions that have been compromised by the disease or injury. Once infused back in the body, these cells can be repopulated at the damaged areas of the spinal cord, through their strong paracrine effects and differentiate into lost neurons or other damaged supporting cells to improve motor as well as sensory functions of the spinal cord. Thus with our standardized, broad based and holistic approach, it is now possible to obtain noticeable improvements in the SCI cases, in the symptoms as well as their functional abilities.